Google is giving its apps and platforms, including Android, a big redesign, according to a recent report posted on Android Police, which backs up some things we had been hearing as well, but hadn’t fleshed out until now. According to the new report, Google is working on a new design language focused on giving all Google apps a more unified look-and-feel across the web, Android and iOS. But these visual changes are only the beginning of what’s in store for Android, we’ve learned. 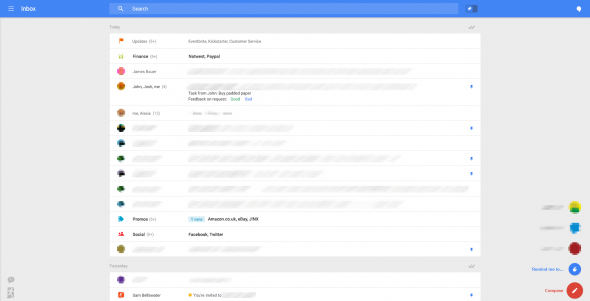 You can see where Google is headed, design-wise, by looking at the card-style layout of something like Google Now, for example, or this leaked screenshot of a revamped Gmail app and mobile website. If Quantum is an early version of Google’s new design guidelines, a related project called Polymer is a framework that can help developers to meet those guidelines. Polymer offers a prototyping tool that lets you build responsive websites using predefined, customizable building blocks. (Google talked about Polymer at last year’s Google I/O. This video, around the 1:04:00 mark, has more.) Polymer is already here on GitHub, but it’s incomplete. Internally, Quantum is being built with a different prototyping tool, which is used to make the user interface/user experience design for Android, but that tool will not be open-sourced like Polymer is. We may hear more about Polymer at this year’s I/O conference, which we’ve heard will emphasize design. Sources say that Google is feeling the pressure of Apple getting better at infrastructure faster than it’s getting better at design. The idea with Polymer is that developers could build reusable elements. For example, a <piechart> element would render whatever you’ve designated as a piechart whenever it’s called. Already, Polymer can be seen influencing Google apps’ design, as in those screenshots of the Gmail makeover leaked earlier. The leaks show new iconography and design choices, some of which are already found in the Polymer designer tool. Of course, to what extent or when any of this will come to Android, the platform itself, is still unknown. But AndroidPolice pegs the arrival of the Quantum framework for Android when the “L” release debuts (we’re on K, or “KitKat,” now). At that point, there will be a new series of guidelines for developers called the “Quantum Paper Spec,” which will speak to overall approach and best uses for the various elements, they report. We’ve also heard that unifying the design language across platforms is just the first step when it comes to the future of Android. Much further down the road, though, the idea is to make over Android not only to resemble something like Google Now with a card-like design, but also to make Android itself more like Google Now. This mobile assistant technology for Android and iOS today brings users information just when they need it, including things like weather, stock changes, sports scores, birthday reminders, traffic reports and more, as well as information gleaned from Google’s own services like Gmail and Google Calendar, such as meeting reminders, shipment notifications for packages, details about restaurant reservations or upcoming flights. Google sees “Google Now” as having the potential to shape Android itself, potentially operating in a way that’s more visible to end users than it is today, where it’s typically activated with a swipe gesture, launched after a user taps on one of the Google Now notifications, or discovered via the Google Search app. In a future version of Android, third-party apps will plug themselves into a Google Now-like architecture in order to surface the data they contain in Google Now’s eerily predictive way. Google Now works with Google’s own services and other data it can extract from your Gmail, like OpenTable reservations, for example. Google currently works with third parties who markup their emails to users to be indexable by Google Now. But opening it up to third-party mobile app makers could make the assistant a better competitor to Apple’s Siri, which is also just now working on more third-party integrations for its own assistant, including, most recently, integration with Shazam for identifying songs. If Google Now became more integrated into Android, the OS might function more like one of those contextual homescreen/launchers, like Aviate (acquired by Yahoo) or Cover, which place relevant apps on Android’s lockscreen. The difference is that Google Now would not be just a layer on top of the OS, but a deeper part of the OS that’s capable of gathering data from the apps that run upon it and using that data to provide users with relevant, timely information and intelligent suggestions. Step one, magical, creepy assistance; step two, magical, creepy ads? There’s also some speculation out there that Polymer (the framework)’s role in this Google Now-ish version of Android could be to help Google better index mobile applications. Today, mobile app indexing is just getting off the ground. Google initially introduced mobile deep linking this past fall, which allows Google search results to point directly to pages within an application. In April, it then expanded its lineup of supported apps. It’s rumored that with Polymer, Google will be able to better index apps, as well, as its crawler technology would be trained to identify and understand the various Polymer elements. For example, if it saw a list element, it would know how to surface the list’s values in an indexable way. If this rumor is true, it could possibly hint at Google doing something in Android with hybrid apps, those that take advantage of web components (HTML5/JS/CSS). If they were more indexable by Google search engines, that would make sense. This smarter, more “Google Now”-ish version of Android is not something that’s arriving any time soon from what we’ve heard. But one day, it could tie into and incorporate data and information from more than just your Google apps and your phone. With Google’s smartwatch platform, and presence in your home (thanks to Nest), Google’s potential data sources — and therefore, its personalization capabilities — expand.